Those of you who follow ThingsThatWeDo.com on a regular basis will know that I’m a mediocre baker at best. My one strength: I persevere. I may not always get it right but I keep on trying and sometimes, sometimes, things turn out magically. Other times, my finished works of art have comedic outcomes. I don’t hide the end results. I’m not happy about it and I wish all my baking efforts resulted in flawless creations but well, that’s just not how it is. Well, this is going to be that kind of post. You see, I’ll tell you what I did and then I’ll show you what happened. You may enjoy the laugh! 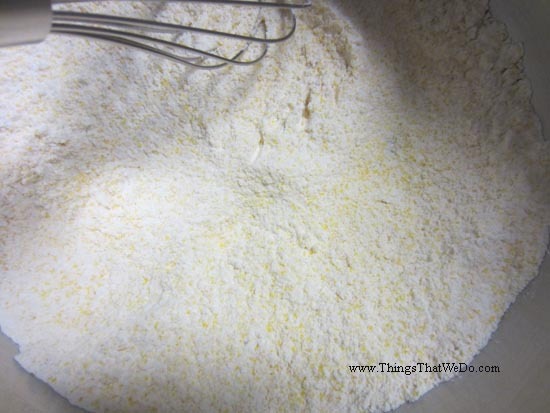 One day, I found this recipe on todaysparent.com for cheddar cornbread tops. The recipe sounded simple enough, our family enjoys cornbread so I figured individual portions would make this a faster equally palatable solution for days when I don’t have time to wait for larger loaves. The recipe itself sounded simple enough and I followed most of it. I made minor adjustments but I adjust almost every single recipe I use so I figured there’d be no harm done. I started it off by combining my dry ingredients together in a big bowl. 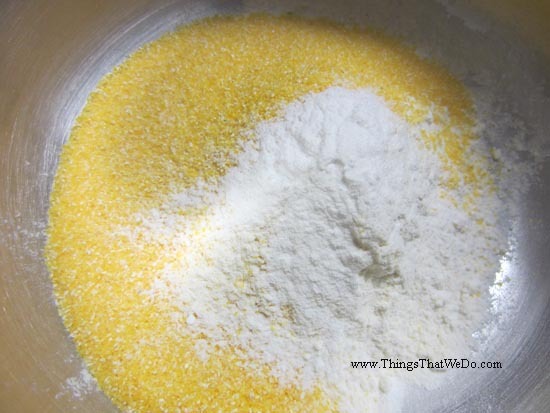 I gave the flour, cornmeal, baking powder, and salt a little stir to mix it up and left it to the side while I focused on the wet ingredients. 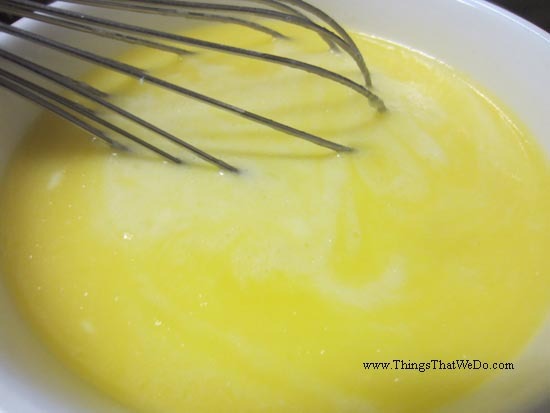 I beat the egg together with the melted butter. 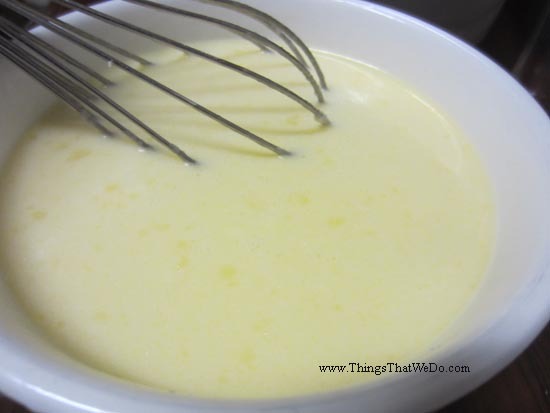 Then, I added in the milk and gave it another stir. At this point, I preheated my oven to 400 degrees. I know I’m slow in the kitchen so I usually only start to preheat my oven when I’m halfway through a recipe. The original recipe asked me to stir the wet mix with the dry mix until it was combined. At that point, I was supposed to stir and mix in the cheese. Well, I didn’t really follow this step. 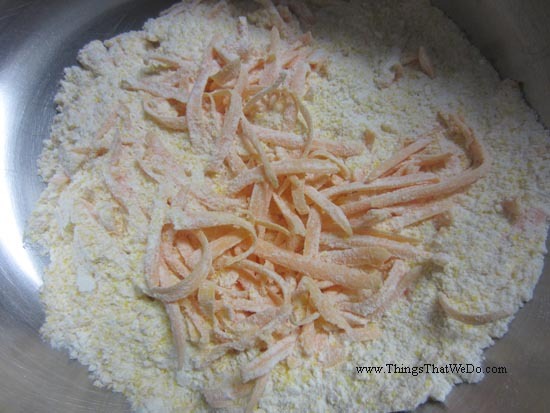 Instead, I shredded the cheese and added it to the dry mix first. I mean, that should make much of a difference, right? 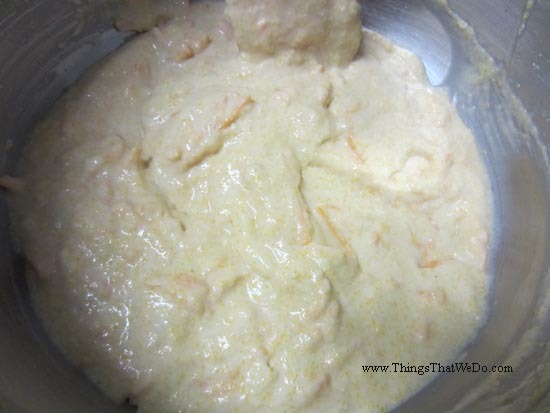 I then added the wet mix to the cheesy dry mix and combined it all together. I scooped plops to my parchment covered baking sheet. Take a good long look at those plops because I guarantee you they did NOT look like the photo of the finished product. At this point, I’m starting to realize that something was seriously amiss. The mixture looked too wet and too flimsy. Unless some serious magic happened in the oven there was no way these plops were going to look like the finished product. 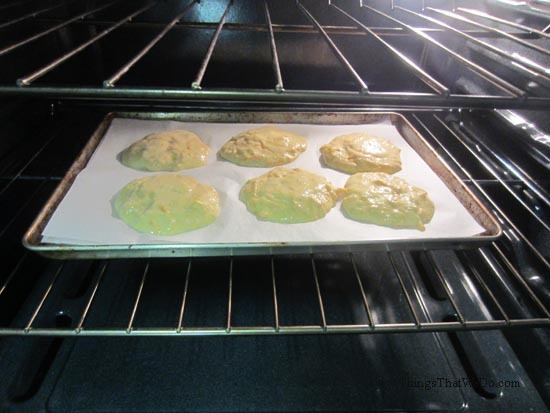 I continued to watch the oven and about 14 minutes later, the plops felt firm enough for me to take them out. The original recipe called for 12 minutes but my plops were still a soggy mess at that point. Let me introduce you to my finished cheddar cornbread tops. Yes, you can laugh. At that moment, I think my baking heart was crushed but it was quite the funny sight. They look more like cookies that cornbread tops. Thankfully, despite the hideous look, the now cornbread cookies were cheesy, savoury, and had the signature cornbread flavour so the family and I managed to eat them all. I don’t know what I did wrong but they were flat flat flat. Did I add too much milk? Did I miss a scoop of flour? Did adding the cheese to the dry mix really make that much of a difference? I honestly have no idea. If you’d like to try your hand at these cheddar cornbread tops, click on the link below. It’ll take you to the todaysparent.com. 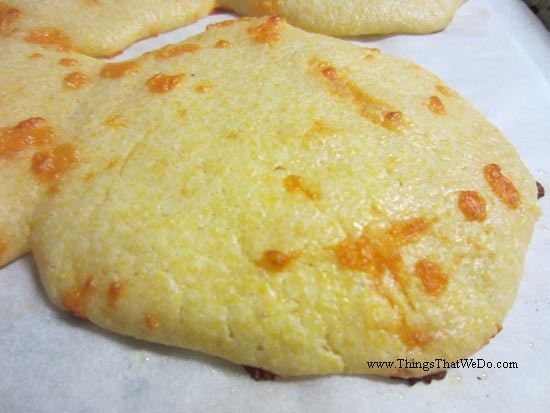 You can even see what these cheddar cornbread tops should have looked like. Maybe yours will turn out a little better than mine.